The GeForce GTX 1080 Ti is our new flagship gaming GPU, based on the award-winning NVIDIA Pascal architecture. The latest addition to the ultimate gaming platform, this card is packed with extreme gaming horsepower, next-gen 11 Gbps GDDR5X memory, and a massive 11GB frame buffer. Pros: I ordered this baby the day it came out, was wondering what it would be like if I waited for aftermarket models, but it turned out to be a sweet purchase! Very quiet, temperatures steady after hours of intense gaming (paired with i7 7700k), this card is a beast. Other Thoughts: Highly recommend this GPU, top notch quality, as advertised. Other Thoughts: I have my 1080ti in a custom loop now and have it overclocked to around 2050 MHz with a max temp of mid 50's C. With the stock cooler the card gets too hot to reach these speeds and would top out in the 1900s range. Overall performance is fantastic and I would highly recommend it for anyone that can afford it. This card is best with 1440p + high refresh or 4k gaming. Pros: Out of the box 2100 MHz 10500 Time spy score. Keeps cool (see below) I put it on a 3770K with a z77. and Total score 8400 not bad. Cons: the OC is not there. No software to do anything with it. Stock settings was 7100 3D Mark TS score. I had to download MSI's OC and once I did that and messed with it this thing went beast mode. But without OC this is just over a 1080. Once you OC this is goes crazy. Runs some games well for a short time. Great for 1440p unless it's Deus EX. Cons: Runs into thermal issues very quickly similar to an older AMD GPU. Very loud blower cooler that doesn't work very well. Still doesn't do well in 4K. Boring green GeForce logo with no color options. Doesn't over clock well at all. Got it up to 1688Mhz for about 20 minutes until the thermal limit cut the performance. Other Thoughts: If you plan on water blocking this GPU or going with an SLI setup the FE design is ok but for anything else it's a poor over clocker and runs into thermal throttling very quickly. 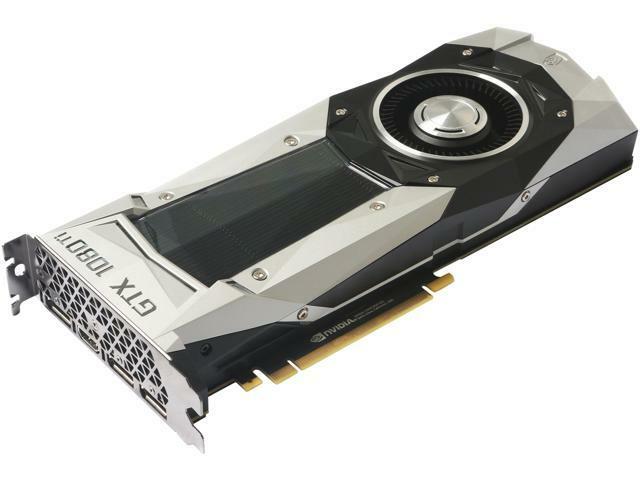 I don't like the fact that most of what was claimed about this GPU being better than the 1080 and Titan weren't true. My previous Zotac AMP Extreme 1080 was a better card and performed much better than this money pit has in every way. Wait for the aftermarket cards or Vega because this experience has been a bust. Thank you for your purchase of our 1080Ti Founder Edition. Please contact our Support Team to begin the RMA process by emailing support.us@zotac.com, or calling 877-599-6822 Mon – Fri 9AM – 6PM. - No anti-aliasing required at 4k because you can't see individual pixels anyway. Cons: - It isn't quite the holodeck from the USS Enterprise. - I've had various video cards and motherboards from Zotac, and everything I've gotten from them is top-notch. Pros: Runs every game on 4k. Does not seem to suffer from GPU sag as other cards have. Zotac software is simple and easy to use for monitoring and adjusting things such as power and fan speed. Cons: With fan profiles set to auto this card settled at 85c while in game which is a little hot for me. Reference cooler design is very loud. Other Thoughts: This is a great card if you must get a 1080 Ti now. However if you can wait a bit, I would wait for a water cooled version of this card since temps climb fast and stay there.